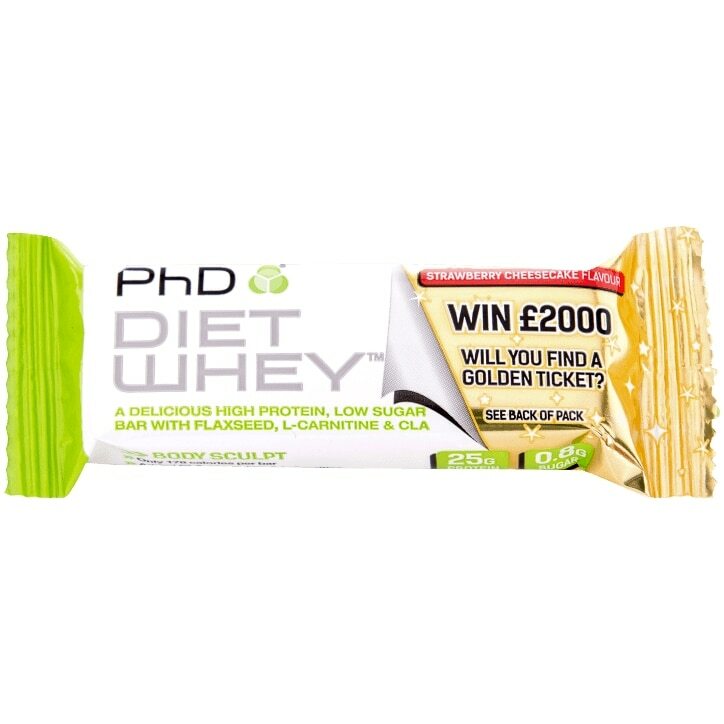 PhD Diet Whey Bar is the brand new high-protein, low-impact-carb bar from PhD Nutrition. With 25 grams of quality protein, only 1 gram of sugar per bar, the usual amazing PhD taste and fortified with CLA, L-Carnitine, Flaxseed and Green tea. Lean muscle-building snack for men and women. Each bar is 50g. Protein Blend (Milk Protein Isolate, Whey Protein Concentrate (Milk)), Hydrolysed Gelatine, Milk Chocolate Flavoured Coating (14%) ( Sweeteners: Isomalt, Sucralose; Non-Hydrogenated Palm and Palm Kernel Oil, Whey Powder (Milk), Fat Reduced Cocoa Powder, Wheat Flour, Emulsifiers: Soya Lecithin, E476; Flavouring), Humectant (Glycerine), Sweetener (Maltitol, Sucralose), Water, Conjugated Linoleic Acid, Reduced Fat Cocoa Powder, Flavourings, Flaxseed Flour, Amino Acid (L Carnitine), Chromium Chloride Hexahydrate. Contains milk, gelatine and wheat. PhD Diet Whey Bar Strawberry is rated 4.3 out of 5 by 4. Rated 4 out of 5 by Boopie from Fantastic Product! I love having these bars after workouts. They can be quite chewy but the strawberry flavour is lovely and the nutritional values are great. So low in sugar and fat compared to a lot of other bars. If you're not a fan of the consistency then I'd definitely suggest heating it in the microwave for 10 seconds, just enough to melt the chocolately outside layer and turn the indide into a delicious gooey delight! Rated 4 out of 5 by Elpida74 from Nice taste!!! It s an easy way to have everywhere you are a really tasty and healthy snack during the day. Low carbs and fat so as not to gain useless calories. It tastes really good !!! Rated 4 out of 5 by HGaze from A solid low calorie protein bar. The macros on this protein bar are pretty solid. Easy to eat with a pleasant strawberry flavour. The texture is quite chewy, which I like because I find it more satisfying to eat. The flavour disappeared quite quickly, but overall it is was enjoyable. Just as expensive as most protein bars.